Some congressional Republicans won their districts this year by distancing themselves from Donald Trump. So when the new Congress convenes in January, they will have to figure out how to work with a president they did not support. Miami's Carlos Curbelo is in that group. He's a Republican who won big in a district that also went for Hillary Clinton. NPR's Greg Allen reports on some of the challenges Curbelo faces. GREG ALLEN, BYLINE: Miami-Dade County school board this week had a swearing-in ceremony for newly-elected members. UNIDENTIFIED MAN: Congressman Curbelo, will you please administer the oath of office at this time. ALLEN: Among the guests, Miami Republican Congressman Carlos Curbelo who started his political career here. CARLOS CURBELO: Please raise your right hand and repeat after me. ALLEN: Curbelo was there to swear in his successor on the school board, a successor who was first appointed to the position after he was elected to Congress two years ago. Curbelo's district includes part of Miami-Dade County and the Florida Keys, and he won re-election by a double-digit margin. His win came despite significant headwinds. 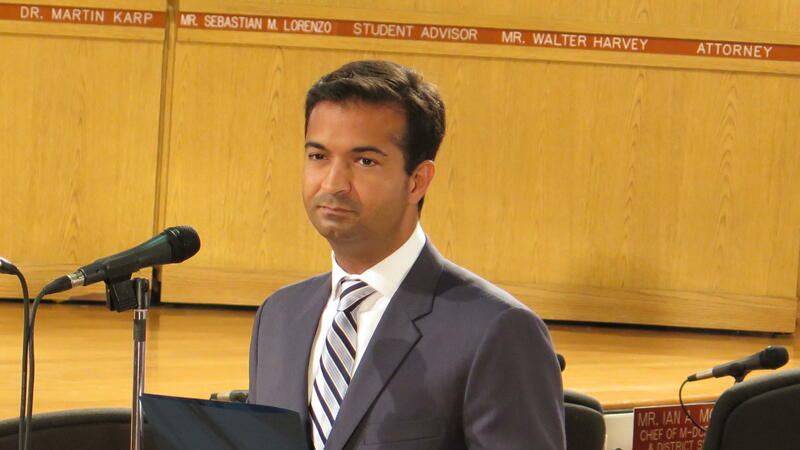 Redistricting a year ago added more Democratic voters, and Curbelo was struggling to overcome not just his Democratic opponent, but also a candidate at the top of the ticket who was decidedly unpopular in this largely Hispanic district - Donald Trump. CURBELO: It was a very ugly campaign. I heard some of the things that we're saying and instinctively I said, you know, I'm not going to support this person. ALLEN: As part of his election campaign, Curbelo ran an ad that showed a clip from Trump's "Access Hollywood" video in which he brags about forcing himself on women. CURBELO: Bragging about offensive, crass behavior, degrading women, lies and corruption. ALLEN: In the end, Curbelo didn't vote for Trump. He cast his presidential ballot for a third-party candidate. He won't say who. Now that the election is over, he's ready to work with the new Republican president. But Curbelo says Trump has a challenge. CURBELO: It's up to the President-elect, Mr. Trump, to earn the trust, not just of the 47 percent of people who voted for him in this country, but of everyone. ALLEN: That includes the more than 60 percent of voters in Miami who voted against Trump and for Hillary Clinton. In a district that's nearly 70 percent Hispanic, there's a lot of concern about the president-elect, particularly on the issue of immigration. Curbelo's most immediate concern is Deferred Action for Childhood Arrivals, or DACA, an executive order signed by President Obama that during the campaign Trump promised he'd undo. It protects from deportation hundreds of thousands of young people brought here illegally by their parents as children. CURBELO: Many of them went to our schools. They speak perfect English. A lot of them don't even speak another language, such as Spanish or any other foreign language. These kids are Americans. Let's give them the full benefits of American citizenship. ALLEN: Another issue Curbelo is concerned about is Trump's stance on climate change. In the past, Trump called it a hoax, but this week softened that position, saying there may be some connectivity between human activity and climate change. Curbelo said he's ready to fight the president on this if necessary. CURBELO: When it comes to climate change and specifically sea level rise, which is a direct consequence, we are the tip of the spear. Most people in my district live near sea level and near the sea, so we cannot backtrack on any of this. ALLEN: On these issues, there's little question that Curbelo is in step with voters in his Miami district. But opposing the president of your own party always carries a risk. Fernand Amandi, with the polling firm Bendixen & Amandi, says while it helped him win re-election, Curbelo's independent position could hurt him down the road. FERNAND AMANDI: If you think about the long-term play here, especially if Donald Trump continues to grow in popularity amongst Republican Party circles and grows in popularity with the American people, it may come back to bite Carlos Curbelo - that position. ALLEN: As he prepares to begin his second term in Congress, Curbelo says he won't be either a cheerleader for President-elect Trump or a permanent critic. He says Congress's role is to work with the president and to hold him accountable, even if he's a member of the same party. Greg Allen, NPR News, Miami. Transcript provided by NPR, Copyright NPR.